Dzhokhar Tsarnaev trial begins: Should it be held in Boston? What it means to hold Dzhokhar Tsarnaev’s trial in Boston. Accused Boston Marathon bomber Dzhokhar Tsarnaev (right) is shown in a courtroom sketch on the first day of jury selection on Jan. 5, 2015. BOSTON—Standing at a podium in front of an audience of potential jurors in the trial of alleged Boston Marathon bomber Dzhokhar Tsarnaev, Judge George A. O’Toole, Jr. took a moment to outline the jury’s sacred role—his words inflected with a light New England accent that betrayed his Worcester birth. He at one point invoked the excesses of “King Jahge,” a tyrant who “made judges dependent awn his will alone.” In the United States, lectured O’Toole, the outcome of trials is entrusted not to a king, or to a government, but to a group of ordinary citizens who will determine the fate of the accused. 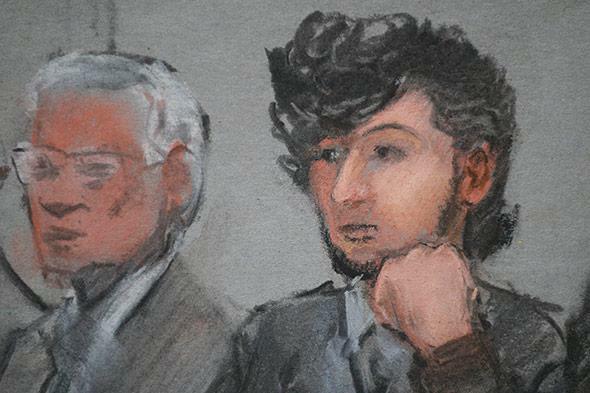 The accused, Tsarnaev, sat a few feet to Judge O’Toole’s right. Charged with using a weapon of mass destruction, bombing a place of public use, and other counts relating to the marathon attack and its associated acts of violence, he sat behind a spindly folding table that afforded little shelter from our gaze. We could watch the shifting of his outstretched legs beneath, and see him scratch at the shins of his light khaki pants. He wore no jacket, and he tugged at the collar of his dark shirt and repeatedly pushed his sleeves up to his elbows. He fiddled with his beard and his mop of hair. He was in constant fuss, in stark contrast with the still-life tableau of motionless attorneys to either side of him. When he stood for a moment at judge’s direction, he crossed his hands at his belt and surveyed the assembled crowd. For many, seeing Tsarnaev’s face must have conjured memories of that chaotic week almost two years ago. Judge O’Toole asked the jury pool to fill out “questionnaihs” that would help determine their fitness to serve, and as folks ticked boxes and scribbled in answers I wondered who here could claim impartiality in this matter. It is surely still fresh in most, if not all, of these minds. Boston’s Marathon Monday falls each year on Patriot’s Day—a major Massachusetts holiday observing the beginning of the Revolutionary War at the battles of Lexington and Concord, just outside the city. (Perhaps this gives context to Judge O’Toole’s sly reference to King George?) I spent my teen years cheering on marathoners from the sidewalk at the end of my mom’s block, thrilling at the chance to play hooky on a day when the rest of the world (well, except Maine, and some kids in Wisconsin) was at school or work. Even after I’d moved away to other cities, I often returned home to be a part of the throng. Marathon Monday is central to the Massachusetts identity. Everyone here felt this crime, to some extent. Most of the state was tuned in to the marathon that day—some lining the 26-mile route that stretches far west of Boston, others flipping between the race and the special 11 a.m. Red Sox game on TV. This attack wasn’t only directed at the people on Boylston Street. It was an assault on the community. And it’s such a small community. After the bombers had been identified, one of my closest friends from childhood told me, with some astonishment, that he’d hung out with Tamerlan Tsarnaev—Dzhokhar’s older brother and alleged co-perpetrator, who died during the manhunt—a dozen times or so around 2010. My friend and Tamerlan had both been part of a circle of pals that smoked weed and played video games and poker in an apartment in Watertown. My friend remembers the elder Tsarnaev brother as a humble, relaxed, smiley fellow, impeccably dressed and with gel in his hair. “Language-wise, he was always really street. He would drop the n-word sometimes. I called him out on it, and he was like, ‘I know, dog, but we’re chill.’ ” On one occasion, during some rowdy pre-gaming before they headed to a club, my friend playfully bulldozed Tamerlan—tackling him onto a couch as they both laughed. Judge O’Toole has refused to move the trial to another location. It’s worth remembering that the most comparable act of domestic terrorism, Timothy McVeigh’s bombing of a federal building in Oklahoma City, was not tried within walking distance of the site of the crime. It was shifted to Colorado in search of a less biased jury pool. Some of the circumstances in that case were different, but there’s no doubt there are parallels in how these two attacks cut at the heart of the regions they damaged. Whatever the final makeup of this jury, the hardest question they face will have little to do with simple guilt or innocence. It’s safe to assume Tsarnaev will have no hope of disproving his involvement in the bombing. There are videotapes. A rumored confession. A revealing, anti-American screed written in the boat cockpit where he lay bleeding. The gut-wrenching decision for this jury will come later, during the penalty phase, when Tsarnaev faces execution. This is a state where a firm majority opposes the death penalty on principle. But Tsarnaev’s jurors, to be chosen, will need to state that they are willing to impose a death sentence if they determine one is justified. Dzhokhar looks older now, thicker in the shoulders and chest. His muscular frame has filled out like that of his brother, the prizewinning boxer. But I remember marveling, along with everyone else, at images of the gangly, doe-eyed kid who emerged from that boat wearing a bloody Adidas hoodie. A stoner 19-year-old pursued by armored vehicles, helicopters, and SWAT teams. He seemed so young. I say this not to evoke sympathy for him, but because it forces us to wonder: What was going on in that teenage mind? There are hints that Tamerlan might have been schizophrenic, hearing voices in his head that pushed him to kill. But no one’s made similar claims of insanity when it comes to Dzhokhar. So was he brainwashed—under the thumb of a psychotic, domineering older sibling who was controlling him? Or was 19-year-old Dzhokhar, legally an adult, fully responsible for his heinous crimes and acting of his own free will? And if it’s the latter, how should we think about this particular piece of evil? Does it make the bombing precisely the sort of domestic Islamo-terrorism that America has feared ever since 9/11? Was this a pair of radicalized Muslims who, despite their American upbringings, came to hate the United States and felt compelled to attack it from within? Or was this (as we seem to be more comfortable surmising) just a pair of messed up brothers who’d spent too much time reading conspiracy theories on the Internet? There were flurries of shots from the cops during that Friday night endgame in Watertown. Some were fired directly into the boat where Dzhokhar hid. He might easily have been killed right there and then. But he wasn’t. And so he’ll get his day in court. And we’ll learn, we hope, more about what happened that week and why. And, almost certainly, at some point along the way—the trial is expected to begin on Jan. 26, and to last three or four months—this jury will be forced to ask itself: Do we wish to put this man to death? The answer will involve a moral struggle between the prosecution, the defense, and a group of ordinary people from eastern Massachusetts.